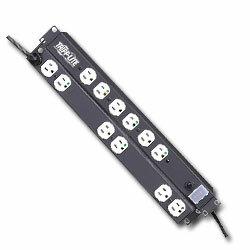 15 Amp Capacity AC Power Distribution in a versatile multi-mount cabinet. Detachable mounting flanges are configurable for rackmount, wallmount, and under-counter installation. Uses only 1 rack space (1U) when installed in any 19 inch rack meeting EIA standards.